Apologies for lack of blogging the last two days, some people care, some people don't so I'll just say it anyway. I went to Acton Scott working farm and Chester Zoo which were both really good. Chester Zoo is highly recommended, was so tired from walking round and cooing over all the cute animals, but very worth it! Went out to the Wine bar with my friends last night and let off some much needed steam with a few large glasses of wine. Been feeling really stressed out the last week as I've been working so hard on a few work related projects. Looking forward to the next month ahead as its totally going to be hectic, more wine is needed. 3 bottles for £10? Yes Please. In a strange choice I decided to wear a brown belt even though black would have been the obvious choice. I just think I like how the purpley blue top & black contrasts so well against brown. Got on the blogger sideways cross thing (anything Laura talks about becomes a thing! ), even though I think its a bit over now! I much prefer this oversized chunky one, I don't really do delicate! There is a better photo of my galaxy nails and a link to the tutorial and polishes I used on my other blog. You look gorgeous! I love the nail polish! Love the shirt! I noticed your absence haha :) I love your necklace as well! Glad you enjoyed the zoo, I'm actually a sucker for zoo's as well! Ahhh you look amazing and your nails are just WOW! As usual i love your look and specially your top and your necklace ! I nearly bought that top in orange today! It's reduced to £3! Nails and clothing look as gorgeous as always! But I just want to know where you find 3 bottles of wine for £10! Like this outfit, and I like the contrast of the colors with the brown belt too. And the necklace looks great! I loove the nail polish. And the outfit! I like the brown belt! More of a better contrast I think. I love the brown belt, i think it looks a lot nicer than a black belt would. Also love the top, I think I can just about see a peter pan collar, and I'm a sucker to those! Those galaxy nails look fab Lily! I must try it out! Glad to see you like the new range of items we sent you! The inverted cross necklace is one of my new favourites! I just love love love that nail polish and necklace! Gorgeous. 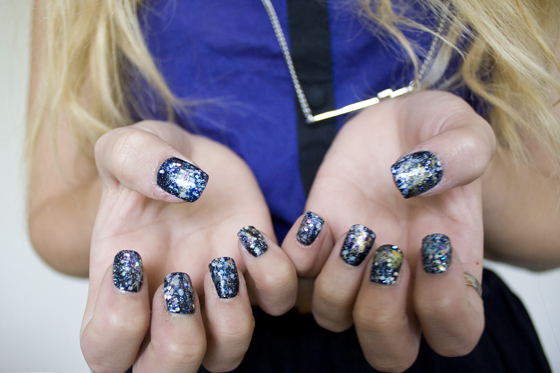 The nebula nail art is incredible and so perfectly paired the royal blue top. love this outfit, & the nails are just incredible! i'm in awe haha. I absolutely adore that top! Love your outfits as always! your nail polish is amazing!!! The nails are great, I really want that skirt - I have it in grey and pink but cannot get the black one! I might have a little look at the belts in primark tomorrow, I really need a plain brown one like that to go with a dress I bought. Oh wow, I love the nails! Beautiful blue and beautiful nails. Wish I had enough different polishes to have a go. Love it! Love the choices you made in regards to the outfit. :) The purple is super flattering on you. i swear, your nails are always so perfectly manicured. Your nails look so good. You look gorgeous, I LOVE your nails!!! 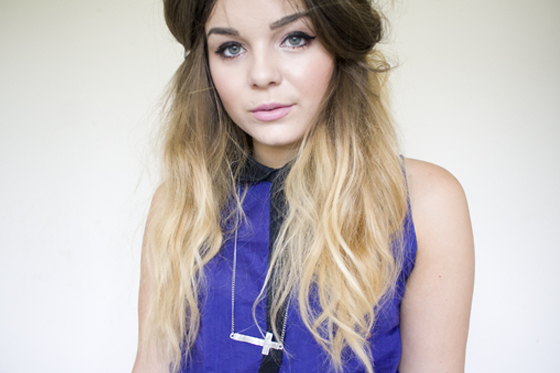 Not checked your blog for ages and I really love your redone ombre hair. Lovely! Those nails are awsome. Makes me wonder why i get acrylics. I need to find myself a skirt like that! jealous!!! whenever I go into primark I can never find anything that I like/in my size! I actually need to hunt to find something! I think the brown belt goes really well! great outfit :-) love it! and those sparklin nails are amazin! hey i saw your blog featured in look magazine, its so cool! love all your outfits and photos. great great photos darling, i really love your colgant! Love the top and the nails! !